This week was the Listener Crossword Setters’ Dinner in Cheltenham. To coincide, we had a crossword by the late (and it wouldn’t be an exaggeration to say great) Radix. Here we had letters and words taken away and added somewhere else, as well as twelve normal clues. As always with Radix, special care had to be taken with the preamble wording… a warning that I didn’t take enough notice of here! At first glance, the wording of 1ac seemed a bit strange: Girl who may wish to gulls two girls with sailor returning fare (9). In speech, it would be said as Girl, who may wish to, gulls two girls, but here the commas were missing and I didn’t really ask myself why. I decided to move on to 7ac which led to MOD, so was, I assumed, a normal clue. The entry in such cases had to be deduced, so MOD was pencilled in lightly. 10ac North American predators fancy bald guys (8) looked like an anagram of ‘bald guys’. Apart from wondering if an eagle was trying to get out, I failed here too. 17ac A skunk and one ai revealing what might be unwelcome in fur (6) looked as though it was coming to my rescue with ATOC (a skunk) + I (one) + A (ai) and the I from ‘ai’ needing to move somewhere, presumably to correct the definition ‘what might be unwelcome in fur’. Some rescue… as I hadn’t a clue what was intended. 27ac Conscript in Oz feared being bullied (7) seemed like it should be DRAFTEE, but where did Oz come in, and what supplied the extra T needed for the anagram. 29ac was a normal clue giving BEEPED so needed to be deduced, and 32ac Judge all students initially with errors excepted (3) was SEE with an extra word ‘all’. With the down clues, 1 was normal and gave EWE, 4 seemed to have ‘spuing’ as an extra word (too weird not to be), as was ‘liquidly’ in 14. Apart from ACADEME at 6 (extra word ‘bathing’), ETUDE at 25 (extra word ”inept’) and EYE at 30 (extra word ‘dog’), that was my lot. Indeed, there was a lot going on, but exactly what proved elusive. I decided to get some help with the ‘bald guys’ anagram, and was amused that they weren’t giant predators, but very small ones in the form of LADYBUGS. Well, the sixth letter crossed the C of ACADEME at 6dn, so it wasn’t just jumbles that needed to be deduced for the normal clues. Well, it was unlikely to be anything so mundane anyway. 13ac Italian who wrote poetic words to arias too (7) looked like it should be ARIOSTO with an extra A in the anagram fodder ‘arias too’, but what was the anagram indicator? Mrs B helped me with AMAUROSIS at 13dn In my country I ween condition is blindness (9), but I couldn’t make head or tail of the wordplay at all. Eventually 3dn enabled me to see the light with If getting up after cold, fleece and waterproof is the answer (7). OILSKIN could be constructed from O (cold) + LI reversed + SKIN (fleece). What if the LI was IF with each letter increased by C, ie 3? So the C was taken away from one word and added to each letter of another. I went back to 17ac and added I=5 to ‘fur’ to give ‘oda’, a harem, where sterility would be frowned upon, and 13ac where A=1 enabled ‘to’ to become the anagram indicator ‘up’. It didn’t take long to suspect that the words that had to be removed from clues would each be added to the answer to a normal clue to give its entry. 7ac MOD + ALL = NAP and 1dn EWE + DOG = ILL confirmed this and I was home and dry. Well… almost. The letters which got taken away and added spelt out Fair Exchange, the alternate title. And I had to make sure that I understood all of Radix’s devious clueing. For example, remember AMAUROSIS at 13dn In my country I ween condition is blindness (9)? That needed the N=14 from ‘wee’ to be added to ‘my’ to give AM + A (a dialectic form of I) + UROSIS (a condition of the urinary tract). All that was left was to marvel at the likes of LADYBUGS + THOUGHTS = FISTICAL, BEEPED + CINEMA = ENSURE and FRANKEST + LIQUIDLY = RARITIES. 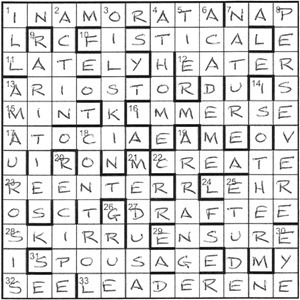 I had a sneaky feeling that I had come across this technique before where two words were added together to give a third—probably a Radix puzzle—but it remained just a sneaky feeling. And so, another fine puzzle from Radix is complete. Will this be his last? The note alongside the puzzle doesn’t seem to preclude this. If it is, however, then a huge thankyou to him for all the entertainment over the years. This entry was posted on 11 April 2014 at 4:00 pm	and is filed under Solving Blogs. You can follow any responses to this entry through the RSS 2.0 feed. You can leave a response, or trackback from your own site. 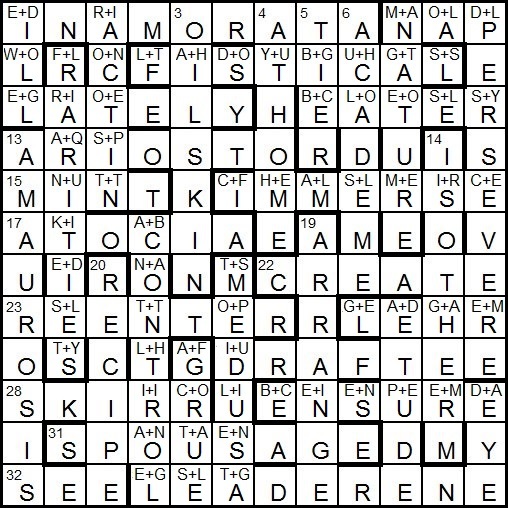 The brilliant Crossword Centre puzzle Slow Down, Walk by Nod (July 2010) added two clue answers to get the grid entry; that may be what you’re thinking of.